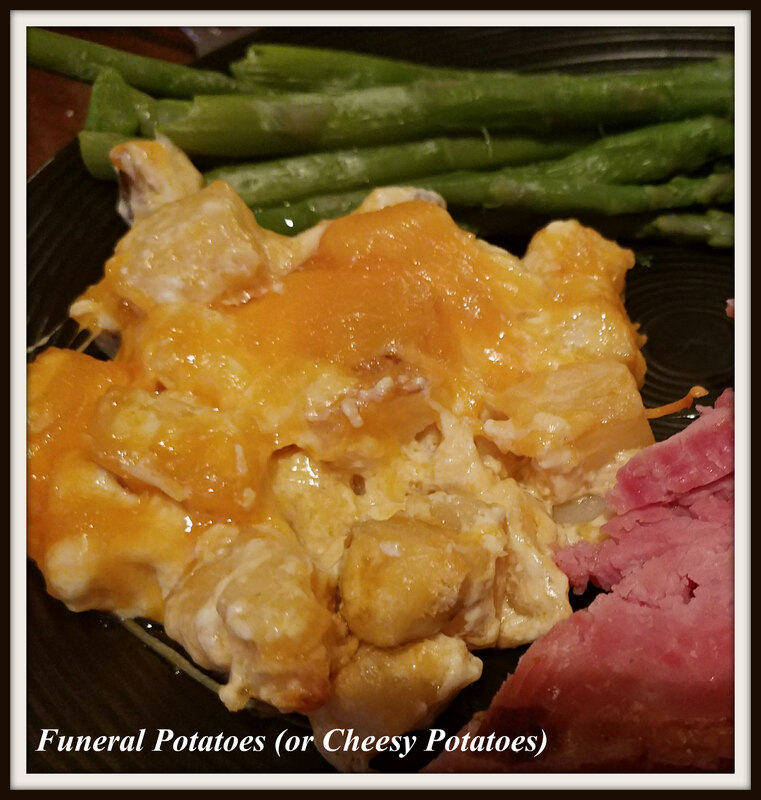 Funeral Potatoes (or Cheesy Potatoes) – What's for Dinner Moms? Did you have one of these on your table this Easter? 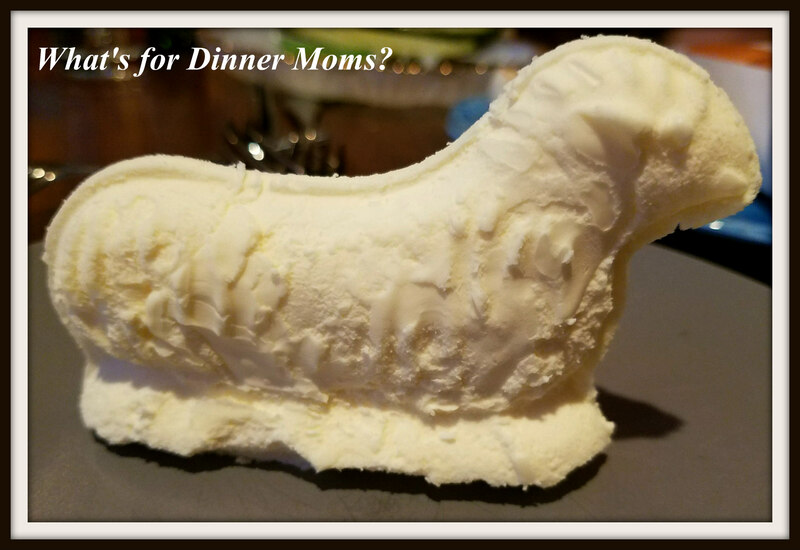 This is a very sad version of a butter Easter Lamb but it is the only one we could find in our area. Butter Lambs are a traditional butter sculpture on many tables at Easter in Western New York. This tradition is tradition mostly Slovenian, Russian, or Polish Catholics. There is a factory in Buffalo, New York that has kept this tradition alive. The lamb usually has black peppercorn eyes and a ribbon cross on it’s back. It is supposed to signify the beginning of Easter and Spring. We are going to order one next year ahead of time because this one looked like a zebra to me. Easter was very low-key this year. My March statistics – I drove 5, 045 miles, stayed in 8 hotels over 22 nights, went to Walt Disney World, celebrated St. Patrick’s Day, went to a Feis (Irish dance competition), and spent a week in Rochester, NY working over 50 hours in 4 days. We arrived home Saturday evening an I was done. Tired. Emotionally and physically I needed a day or two to recover. So, Easter was super simple this year. We had ham, asparagus and Funeral Potatoes for Easter dinner. I always thought Funeral Potatoes was a funny name for a dish but it is a standard dish that many people took to grieving families for the gathering after the funeral in some areas of the country. It can be cubed or shredded potatoes, lots of cheese, and a can of cream of something soup. Because we were away for most of March I used frozen potatoes that I thawed in the refrigerator overnight. This dish was so simple to make. This was a split decision dish. Two of us liked it and two though it was okay. My daughter does not like canned soup in anything so she was against it before she even tasted it. As she was making it she said, “Soup should NOT make that sound coming out of a can! Why does it look like jello?” That was a tough sell from the get go. She ate it but was not going to say anything other than it was “okay.” I thought it was fine especially with extra black pepper on top. It was plenty salty but definitely needed a sprinkle of pepper. Preheat oven to 325 degrees. Spray an 8 x 8 pan with non-stick spray. In a large bowl mix together potatoes, sour cream, butter, soup, 2/3 cup cheese, dried onion, and black pepper until well blended. Pour into prepared pan. Sprinkle top with remaining 1/3 cup of cheese. Bake for 40-45 minutes until center is hot and potatoes are cooked through. I’ve never gone to a funeral that had these potatoes.. heard about them in movies. I think it’s a southern thing. They look good. Definitely a Southern thing but it has spread to other areas. Macaroni and Cheese is big here. I was wondering what that photo was…cheesy potatoes sound appetizing. Thank you, Marci! Comfort food..I never heard funeral potatoes but makes sense..yummm.. Potatoes, onions, cheddar cheese, sour cream… definitely a remedy I love!! I have never seen one of these ever! I am sure you are all tired out dear Marci! Nice story; interesting dish with a fascinating name – similar to traditional dishes served after funerals in East Texas. Thank you! I actually heard a radio station from NY talking about this yesterday because Wal-Mart has begun selling funeral potatoes and people were upset by the name. For some reason, my potato haven’t cooked all the way the last couple times I’ve tried making these. I can’t figure it out. They just don’t turn out for me. It’s a bummer because they’re one of my favorite things! Hmmm. Are they fully thawed when you make them? I also wonder if the cut of the potatoes is too large in the brand you use. I use the smaller diced or you could try the shredded ones too. The recipe works with that too. Hope this helps some.